This year, that page is taped to my professor’s door. I must now proudly share my wisdom. Suppose P, Q and R are propositions. If you have P, then you have Magically Q. 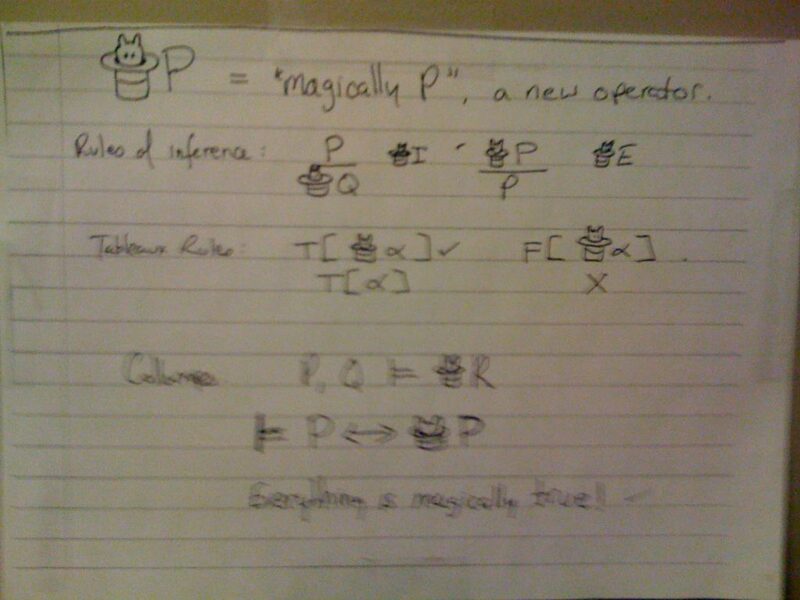 If you have Magically P, then you have P. Semantically, if you know that magically φ is true, where φ is some formula, then φ is true. If you find yourself with a false instance of a magical operator, you know that your interpretation is contradictory. Important corollaries are “P if and only if Magically P” and, more importantly, for any proposition P, P is magically true. Hey, there are people out there who accept modal realism. They may as well accept this. Thanks to Professor Paul Rusnock for promoting my madness.